Yvonne, photographed from a distance, when she was on the run. For three months, she’s held a whole country spellbound. 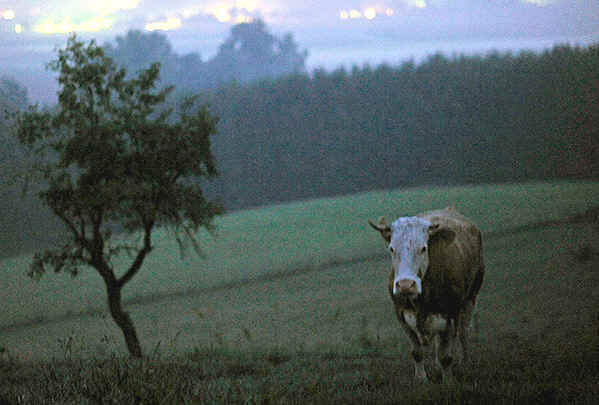 As if sensing that she was next in line for the slaughterhouse, Yvonne the cow broke through an electric fence on a farm near Munich, Germany, and headed for the forest. A few days later she was almost hit by a police car while crossing a highway, and was promptly designated a public danger who should be shot on sight. But 6-year-old Yvonne managed to outwit numerous search parties, hanging out in the depths of the Black Forest. In one attempt to recapture her, local authorities brought her calf out to the forest to try to lure her in. When that failed, the founder of the Gut Aiderbichl animal sanctuary, Michael Aufhauser, brought in Ernst, a virile bull with “a deep baritone moo” to lure her home. “He is the George Clooney of bulls,” Aufhauser said. Yvonne, however, was not impressed by the Clooney moo-alike. Then an animal communicator from Switzerland professed to be in contact with her telepathically. But Yvonne clearly wasn’t giving out her psychic phone number. Finally, a few days ago, apparently feeling lonely, Yvonne jumped a fence, wandered onto a farm near the Austrian border, and made friends with the cows there. The farmer checked her ear tag and then called to claim the 10,000-euro prize offered by the German newspaper Bild. By now, the German public was in no mood to allow her to be taken away to the slaughterhouse. Instead, the Gut Aiderbichl animal sanctuary purchased her from her original farm, and she is now grazing happily at her new home-for-life with two other cows, Friesi and her sister Waltraud.